Whenever I decide to grill something, I always like to have as much of the meal grilled as possible. That means fewer dishes to do, and it also means that my husband will make the whole thing. These vegetable skewers are just the thing. They go so well with a simply grilled chicken breast and some grilled spicy potatoes tops of the meal. It’s important to marinate these vegetables, but I like to do that while I’m thawing the chicken breast and prepping the potatoes. While it’s possible to marinate these for up to 12 hours, I’m usually not organized enough to get that done. And since the veggies are basted with the leftover marinade while they’re being grilled, they are still just as tasty even when they’re only marinated for 30 minutes. Grilling veggies is great fun, not to mention healthy and easy! 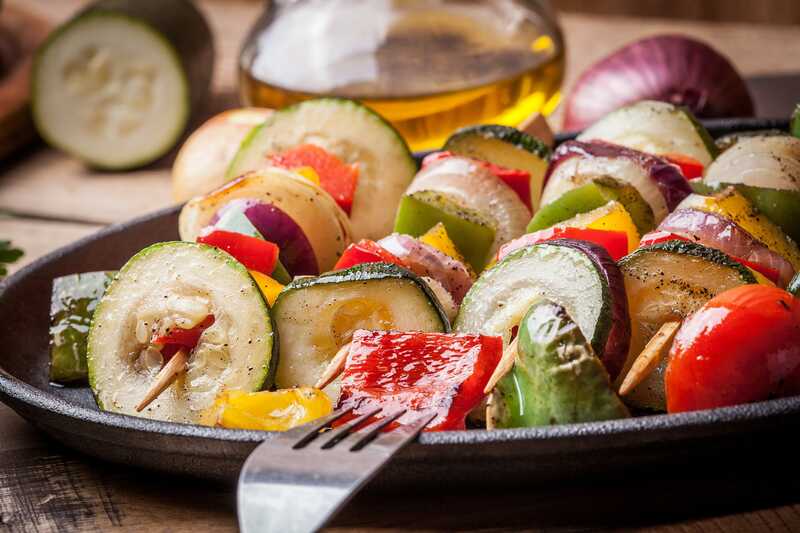 These grilled vegetables skewers are perfect to add a tasty and colorful side to grilled chicken breast, steak or fish. In a bowl, whisk together the sesame seed oil, soy sauce, honey, garlic and ginger. In a large Ziploc bag, combine the vegetables and the marinade ingredients. Shake the bags to coat the vegetables with the marinade. Refrigerate for at least 30 minutes, or up to 12 hours. Turn the bags once if marinating for 30 minutes, or several times if marinating longer. Soak wooden skewers in water for 10 minutes. Thread the vegetables onto the skewers. Reserve the marinade. Grill the skewers for 8-12 minutes, until the vegetables are tender. Brush the vegetables with the marinade each time they are turned. Serve hot.